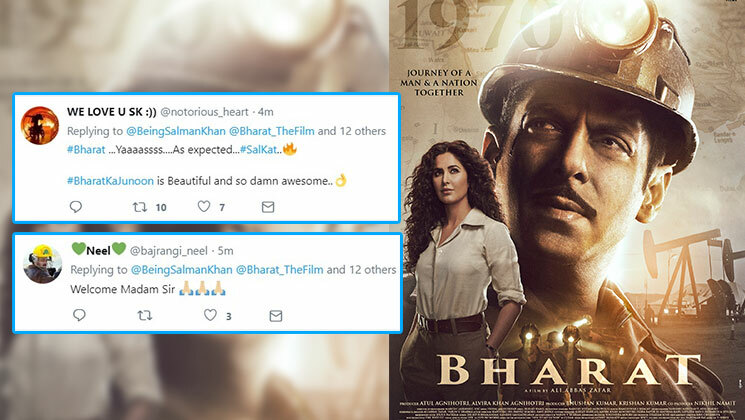 ‘Bharat’ actor Salman Khan is on a poster releasing spree. Since the last two days, the actor has unveiled his two different looks from this Ali Abbas Zafar directorial, and today finally we got to see Katrina Kaif‘s look in this highly anticipated film. The latest poster of ‘Bharat’ features both Salman and Katrina and it’s really looking mind blowing. Sharing the poster on the micro-blogging site, Salman introducing the gorgeous Katrina wrote, “Aur phir humare zindagi mein aayi ‘Madam Sir”. In the film, Katrina plays Bharat’s love interest. But we are wondering why he introduced her as ‘Madam Sir’. Perhaps we will come to know about it when the film’s trailer is out. As soon as the actor shared the poster, Twitterati went gaga over Salman and Katrina’s look. They soon started praising their favourite on-screen jodi. You can check some of the comments of Twitter user below. Some fans were so overwhelmed by Salman and Katrina that they started urging them to get married! With ‘Bharat’, Salman and Katrina are working together for the seventh time. Previously they have given some blockbuster hits like ‘Ek Tha Tiger’, ‘Tiger Zinda Hai‘ and ‘Maine Pyaar Kyu Kiya’ to name a few. Their on-screen pairing has always been appreciated by their fans. And we are expecting them to create the same magic this time as well. Trailer of ‘Bharat’ will be out on April 24 and we are eagerly looking forward to it.